Sooth your senses to sleep with ArtNaturals Sound Machine and Essential Oil Diffuser. From the ArtNaturals Beggings Collection, This unique combination of calming white noise and relaxing aromatherapy will have you drifting off into dreamland in no time, then waking up fully refreshed. The Sound Machine is programmed with six different natural, white-noise sounds that encourage the mind to release and become still, allowing the normal sleep cycle to begin sooner. The white noise also helps to block other, disturbing sounds, such as snoring, mechanical noises, or barking. All ages, from baby to child to teenager to adult, benefit from the deeper, sounder sleep promoted by the Sound Machine. Sound is paired with scent in the 300 ml. 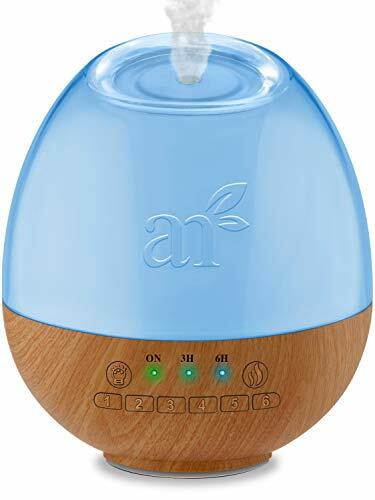 Essential Oil Diffuser, which uses silent ultrasound vibrations to mist essential oil essence throughout the room. No heat is used, making it safe for children, and the sleek, sculptural Diffuser glows with soft LED light. The Diffuser distributes the oils throughout your chosen area in the form of a gentle, smoke-free mist that wafts delicate, healing aromas while softly humidifying a dry atmosphere. Deep relaxation results, as the stress-relieving scents fill you with a sense of serenity and peace. Our Diffuser uses patented ultrasonic technology. Sonic vibrations silently create an ultra-fine mist, delivering maximum humidifying. This quiet process means you can enjoy the benefits of your Diffuser’s healing mist with-out disruption or noise pollution. The powerful 110-240-volt, 12-watt system ensures mist distributes even in larger rooms. Choose from seven soft LED colors to set the perfect sleep mood. The auto off function allows you to leave your diffuser unattended. Just add a few drops of your favorite blend to the water reservoir, turn on the Diffuser and relax. The included nightlight allows you to choose just the right amount of light for overnight use.